Transition Palo Alto is sponsoring our fourth book discussion group. 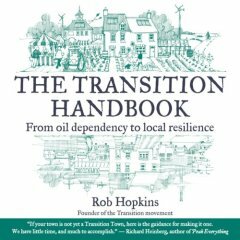 Join us to read The Transition Handbook: From oil dependency to local resilience by Rob Hopkins (founder of the Transition Movement). We will meet weekly for six weeks to learn about Transition and consider personal and community responses to the threats of peak oil and climate change. The groups so far have inspired a vital interactive hands-on community of resourceful and talented people. Our first meeting will be Thursday, January 20, 2011, from 7 to 9 PM. If you are interested, please let us know by sending an e-mail message to Emily Rosen (mlerosen at jps dot net), and she will send out the details. More information about the book is below. Hope you can join us! Thanks for participating in our fabulous Films of Hope and Vision Film Series! At our potluck on June 18, we talked about ways to learn more and take action. Please read on for information and group contacts. If you’d like to be on the list for a group, just drop the group leader a email message. We hope to see you at our next Film Series (tentatively scheduled for September). And we’ll let you know about any other activities of interest! The group shared interests, including lawn conversion, fruit trees, apartment gardening, agroecology, tinkering, and information sharing. We are considering an intergenerational gardening project in San Jose that would give us a chance to be involved with gardening and local community members. If you’re interested in keeping in touch on this project or other related activities that come up, please write to William Mutch at permifree AT yahoo DOT com. Motivated by the film series, about 10 of us will start reading the “The Transition Handbook” as a book group in July. An email message will soon go out to those who have signed up. The group will be co-chaired by Bart Anderson, Paul Heft and William Mutch of Transition Palo Alto. If you are interested (and haven’t signed up already), please write to Bart Anderson at bart AT cwo DOT com. We talked about starting a new film series on Energy/Transportation in September. To do so, we’ll need to identify and preview films. Our first group assignment is to work on ideas. Then we’ll get together starting in July to preview and select films. Also, group members expressed an interest in activities over the summer to continue community building. If you have ideas or would like to help with film series planning or other activities, please write to Barbara Weinstein ( barbara AT ontrk DOT com ). Resilience refers to the ability of a system to hold together and maintain its functions in the face of change and shocks from outside. The book argues that building local resilience is key. A resilient culture thrives by living within its limits, and can function indefinitely. The Achilles heel of economic globalization is its degree of oil dependency. Moving away from oil dependency, toward more localized energy-efficient and productive living arrangements, is inevitable. Our culture is underpinned with cultural myths, misleading and harmful stories, which we must replace. A group of us met every week or two to discuss The Transition Handbook. Afterwards a few attended a “Training for Transition” workshop.